I can’t remember when I first saw Iceland Air advertisements on the Boston “T” (subway), but I think it was at least five years ago. Day after day on the way to and from work, I would gaze at the colorful swirls of the Northern Lights and wondered what it would be like to see them in person. It wasn’t until February, though, that I tried to check this item off my every-growing bucket list. 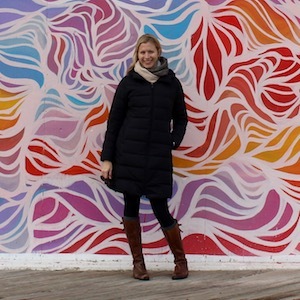 I had planned a long weekend in Copenhagen with my friend Julianne of 5 O’Clock Somewhere and realized that extending my trip to spend 48 hours in Reykjavik made a lot of sense. I found an Iceland Air flight that arrived early on a Wednesday morning and then left for Copenhagen on Friday morning. Unfortunately my timing was a bit off in that a bad storm blew in just as my flight was landing. The weather was pretty miserable during my stay – even for this Bostonian – and my Northern Lights and ice cave tours were cancelled. I was disappointed I wasn’t able to leave Reykjavik, but I ended up really enjoying the world’s most northern capital. Read on to find out more about what I did, where I stayed and how I got to and from the airport during my two-day stopover. I discovered I Heart Reykjavik when I was looking for early-morning activities, and I’m very glad I did. Not only is it an incredibly thorough and helpful blog by a local woman named Auður, it’s also a tour company and travel agency. I booked the 10 a.m. walking tour, but due to the storm, it was pushed back until 1 p.m. when the skies cleared up a bit (just a bit!). I met my group and our guide, Ásta, at Hallgrímskirkja, the Lutheran church that towers over the city. In two “small world” coincidences, one family in my group was from just north of where I live in Boston, and the other was from Syracuse, where I went to college. 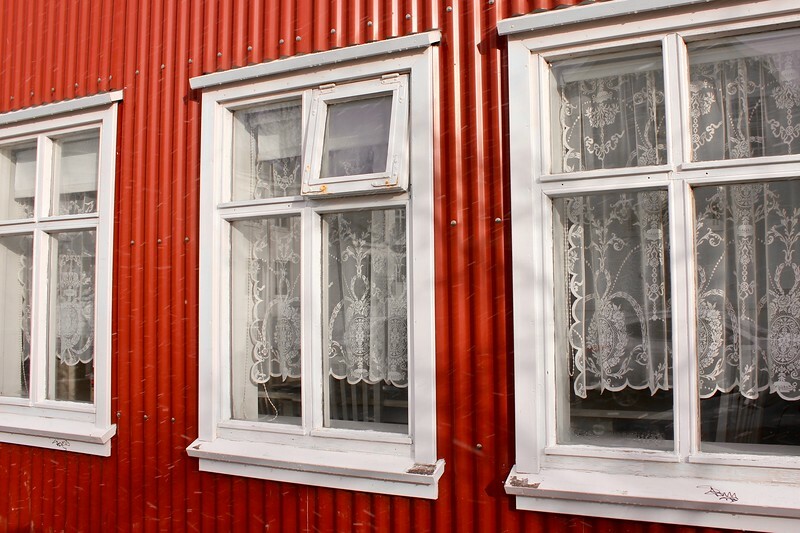 The tour was a little over two hours, and as we wound our way through the streets on our way to the main attractions, Ásta told us interesting tidbits about everyday life – like Icelanders always leave a window cracked and think books make the best gifts. 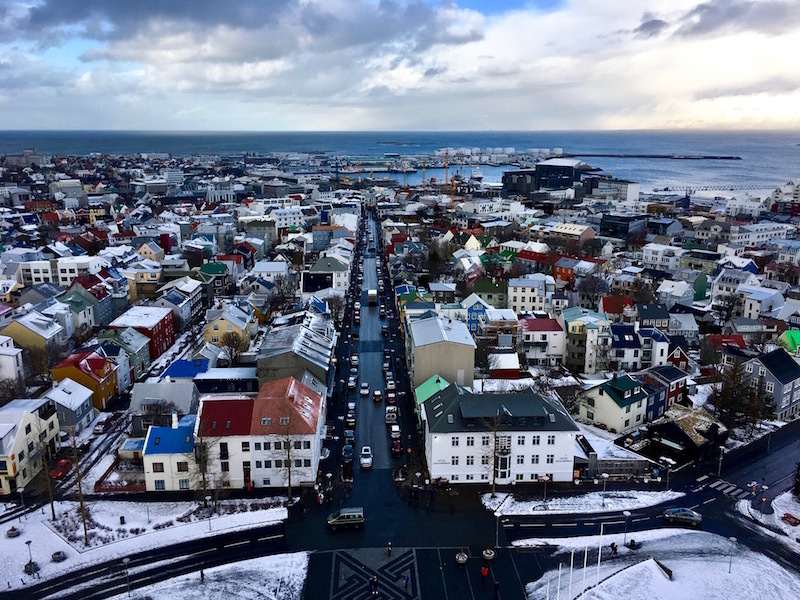 Tip: Iceland is a very walkable city, but if you’re going in winter, know that the sidewalks generally aren’t shoveled or salted, so they can be slippery. Be sure to have sturdy boots with a good tread. Check out the street art. 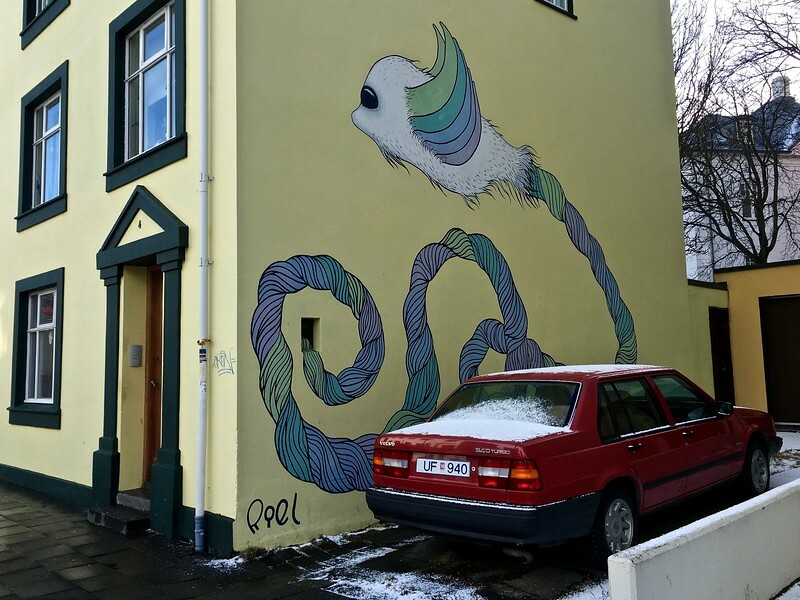 I had really been looking forward to checking out Reykjavik’s street art scene, and it did not disappoint. Ásta pointed out a few popular pieces along the route of our walking tour – including a pink octopus painted on a garden wall. She also filled us in on a few fun facts like many of the country’s popular street artists are women – which is still unusual in 2018 – and that homeowners and businesses can commission their own murals to brighten up their properties. Also 20 of the city’s murals were created as part of an inventive art/music collaboration that coincided with Iceland Airwaves in 2015 and 2016. On my second day, when the sun was a little more cooperative, I challenged myself to photograph as many murals as I could find, and I think I made it to about a dozen. It’s hard for me to pick a favorite, but I think I liked Sara Riel’s quirky piece, Furry Flight on Njálsgata, the best (pictured above). See how the Vikings lived. Upon Ásta’s recommendation, I headed to The Settlement Exhibition first thing on my second day in town. 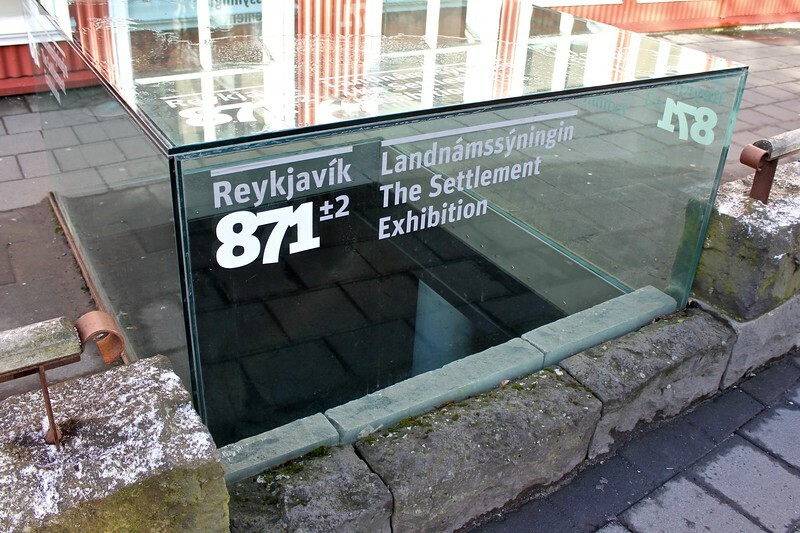 The exhibition’s official name is The Settlement Exhibition–Reykjavik 871± 2, which doesn’t quite roll off the tongue, but it indicates the estimated year a volcanic eruption covered the area in a layer of ash. The focal point of the exhibition is a 10th-century Viking longhouse, which was uncovered during construction in 2001 (one piece of wall was built prior to 871). You can press lights that illuminate different parts of the rock foundation to learn what once took place in each part of the house. Displayed on the walls of the circular room are illustrations and artifacts that give you a glimpse into what life was like for Iceland’s earliest settlers. You probably don’t need more than 90 minutes here, so it’s a great way to learn about Iceland’s history amount of time. 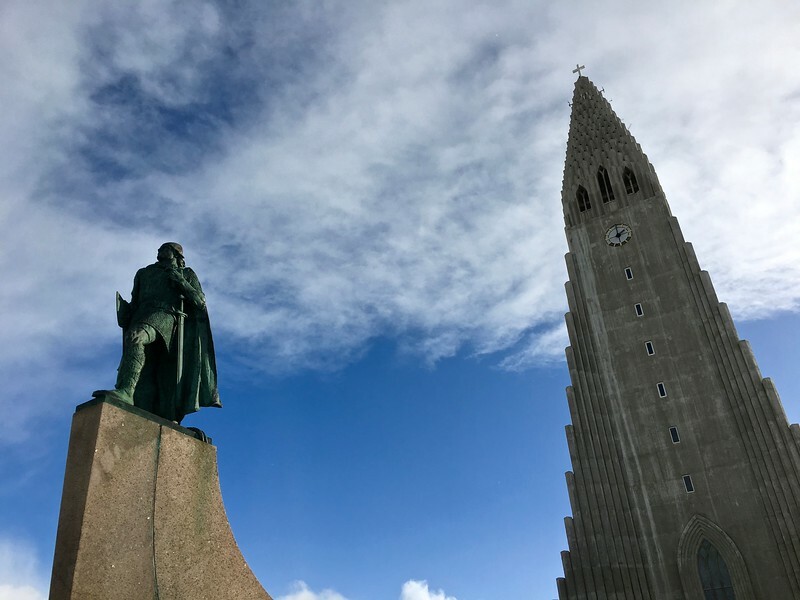 I returned to Hallgrímskirkja on my second afternoon in town after the storm had passed. I wandered around the interior – checking out the simple altar and impressive 25-ton pipe organ – and then decided to buy a $10 ticket and ascend the 73-meter-high tower in hopes of taking in 360-degree views of the city from above. Luckily my time at the top coincided with a stretch of sunshine that lasted long enough for me to snap a few photos before the clouds rolled back in. Through the mesh window coverings, I was able to see far out over the colorful roofs and many construction sites that clutter the city to the icy sea and snow-topped mountains beyond. Tip: If the weather cooperates, this is a good first stop when you arrive in Reykjavik, so you can orient yourself to the area’s geography. Icelanders are incredibly proud of Harpa, the city’s hub for arts and culture. Home to the Icelandic Symphony Orchestra, Reykjavik Big Band and Icelandic Opera, the massive, geometric structure towers over the Old Harbor, lighting it up in a rainbow of colors at night. Unfortunately, I didn’t have time to see a performance, but I stopped by in late afternoon to warm up and see how the glass-tiled walls illuminate the interior. Tip: I thought the Icelandic Sagas and How to Become Icelandic in 60 Minutes both sounded quite entertaining for tourists. 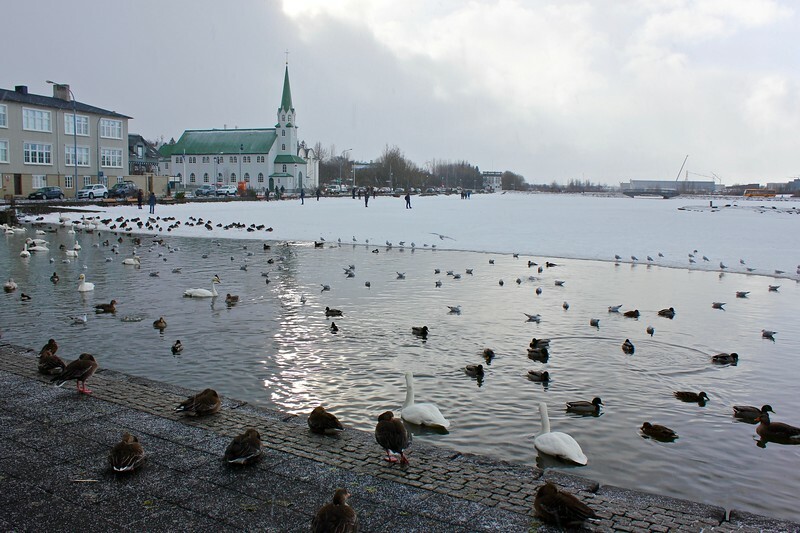 Since cameras were not allowed at the local pool, here are some ducks and swans enjoying Tjörnin. A popular stop for many tourists on the way to and from the airport is the Blue Lagoon. However, I didn’t realize that you needed to buy your ticket well in advance; they were sold out when I went online about two weeks before my trip. I think it worked out for the best; however, because spending a relaxing evening at a neighborhood pool, Vesturbæjarlaug, was definitely the highlight of my trip. After purchasing my ticket, I followed the strict instructions headed to the locker room to disrobe and shower. I had been warned that you must shower naked in a large open room, and as an uptight American, this terrified me. But I survived – even cleaning myself with soap according to an illustration – and then put my suit on for the chilly walk outside. I closely monitored what the locals appeared to be doing to try and get the full experience. I started by swimming a few laps in an Olympic-sized pool, then sat in a series of four smaller pools – one was rather large, but the three smaller ones fit only four or five people at a time. The last one was 45 degrees C, and I only tolerated it for a few minutes before taking a quick dip in the cool pool and shuffling very quickly back inside. After drying off, my skin was pink and soft, and I had a glow that lasted for days. Tip: The most common Blue Lagoon package costs about $100 US, whereas the ticket to Vesturbæjarlaug cost about $10 US, so a local pool is a great alternative if you’re on a budget. 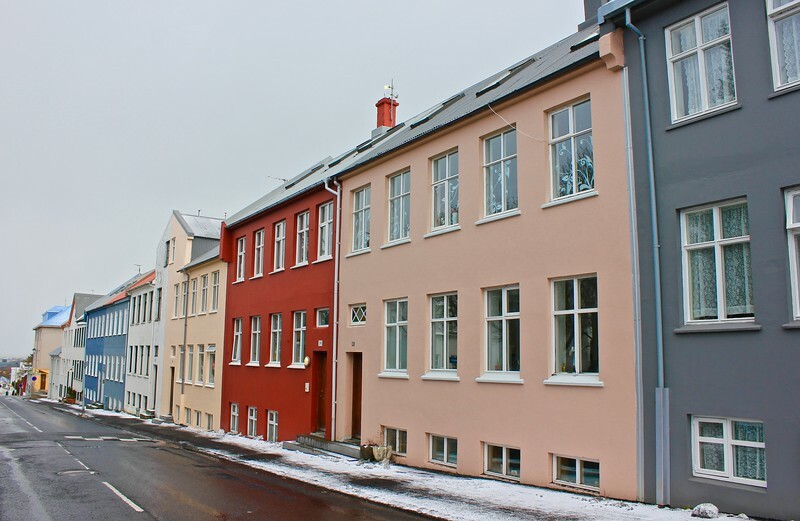 Hostelling International Iceland has 32 properties throughout the country and three in Reykjavik. I stayed at the Reykjavik Downtown Hostel, which was perfect for my needs. Because I only had 48-hours in Reykjavik, I wanted accommodations that were close to both an airport bus stop and the city center. You also can book your tours, including car rental packages, through HI Iceland, which makes planning easy. I also found Reykjavik Downtown Hostel to be very comfortable and inviting. The lobby area has plenty of tables, and I enjoyed hanging out there and working in the company of the other guests. There is a free continental breakfast every morning as well as additional drinks and snacks for purchase. I had a lovely private room with two single beds on the top floor as well as access to a large common area with couches, a refrigerator and a kitchen sink. The shared bathroom was quite clean, and I never had to wait to use it. Reminding guests to drink the tap water and not buy bottled water. If you are not renting a car during your visit, I recommend taking a bus to and from Reykjavik and Keflavík International Airport. I booked my round-trip Flybus ticket directly through the HI Iceland website (about $27 each way). 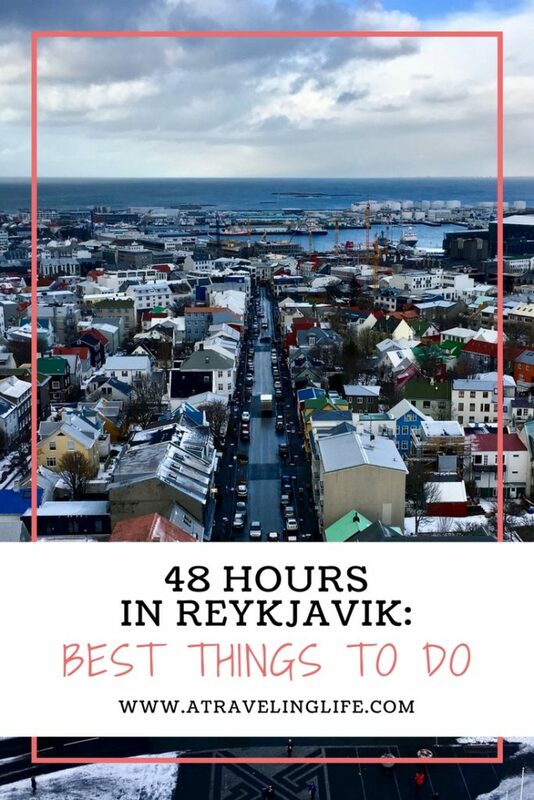 What do you think are the best things to do during 48 hours in Reykjavik? Thank you to Hostelling International Iceland for hosting my accommodations during my 48 hours in Reykjavik. Thank-you for a great article and photos.My wife and I will take a Baltic cruise in the fall starting in Copenhagen and ending in a Stockholm. We plan to take Iceland Air and take advantage of a stopover. You provide great suggestions. What did you do for evening meals and can you suggest good and reasonable places to eat? The hostel looked really clean and cozy. Thanks again. Thanks, Lorne, for reading. That sounds like a fantastic trip – those are three of my favorite cities! I will be publishing a Reykjavik food and drink post this week, so I can email that to you. I tried to stay on a budget by eating at coffee shops like Babalu and Kaffibrennslan. My favorite meal was a basket of fish and chips at Reykjavik Fish, which is also casual. One tip is that if there’s a more formal restaurant you want to try for dinner, and you have a tight schedule, it’s a good idea to make a reservation. 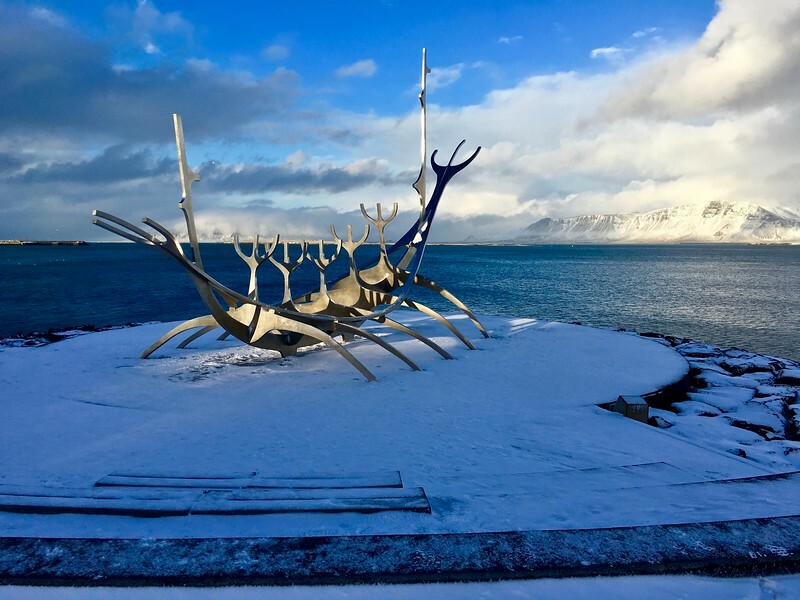 Great write up on how to spend two days in Reykjavik, Brianne! Unfortunate on the Blue Lagoon but as so many people go there it’s great that you were able to cover a cheaper and alternative pool, among other cool recommendations. Iceland has been on my list for a long time and Icelandair flies out of DC, so this is great inspiration to schedule a stop next time we head to Europe. I’m hopeful one of the Icelandic carriers will start flying to Greece in the near future! I have visited there once for two days. It is a very beautiful and coolest place. I really like it. Want to go there soon for more days. Thanks for sharing this blog. Thanks for reading! I hope to go back as well and stay a lot longer. 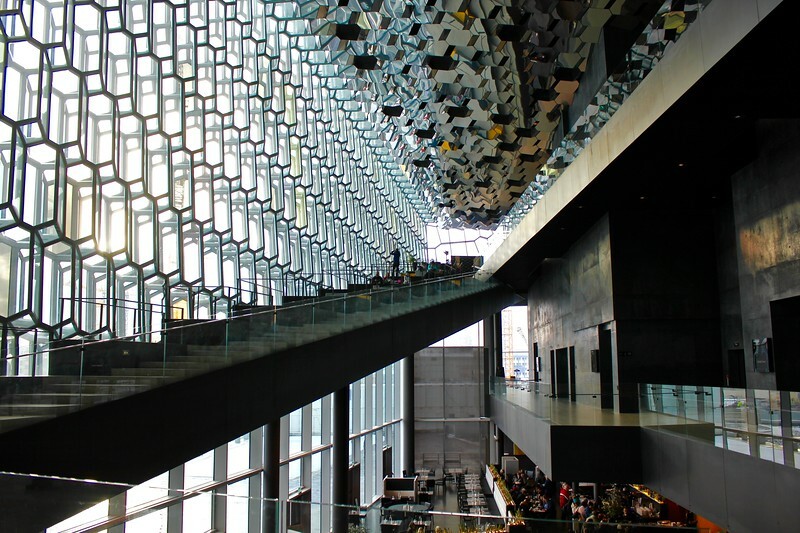 The interior of Harpa looks well worth seeing. I orientated in the city with a Segway tour, starting down by the harbor, and would wholeheartedly recommend that. Thanks for reading and thanks for the recommendation! A Segway tour sounds like a fun thing to do in the summer when there’s no snow or ice on the ground! Nice Post! Iceland is always top of my bucket list. I am also going to Iceland in the next month with my family. Thanks for sharing it.